This whole reduced calorie vodka thing is not that new to the scene as we all know Voli has done this a year or two prior. I was actually conversing with a liquor store manager about the whole low calorie thing, and I wanted to try out Voli. I saw that they had it there briefly. Now, it's nowhere to be seen because people in the D.C./MD/VA area don't really care for a low proof vodka. If you actually break it down, Vodka actually doesn't have very many calories compared to other alcohols because there isn't a crazy amount of sugar or components to make vodka. 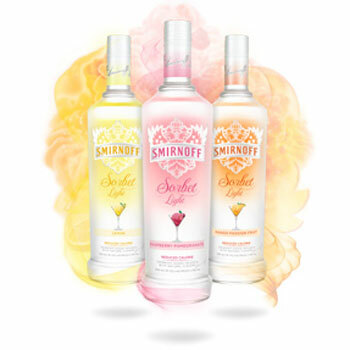 While I am not a big fan of Smirnoff, it is very affordable. And most people identify Smirnoff with Vodka. The fact that it is still a household name and the show "Master of the Mix', a deejay based show that Smirnoff sponsors, is on the air every week gives the brand a chance to really be seen by millions of viewers weekly. So, given the reputation of Smirnoff and the type of cross branding power it possesses, their low calorie vodkas have the chance to breakthrough bigger because they have a better marketing plan than Voli. Also, it's the right time due to summer coming up and the flavors "Mango", Lemon and "Raspberry Pomegranate" are just right for the ladies.